This is a stunning apartment & building located directly on San Martin Square. The Studio offers a living area with comfortable sofas. Dinning area with glass table and chairs . 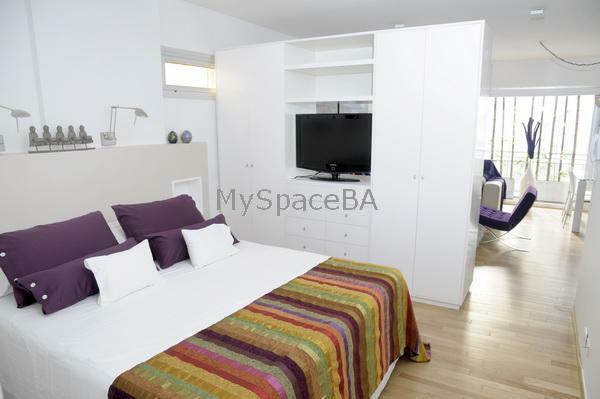 An open plan kitchen and a bedroom area with Queen size bed with a complete bathroom. Balcony . Ample and quiet apartment. LCD TV with cable . Internet . Kitchen with fridge, microwave . Toaster . Dishes . etc . Brand new building . Doorman 24hs . Elevators . Swimming pool for summer season . Sauna . Gimnasium . Downtown, Train Station, Subway, Bus Station, Bus Stop, Gym, University, College, Museum, Church, Historical Place, Art Gallery, Theatre, Cinema, Restaurants,Pubs, Shopping Mall, Cultural Center, Park, Square, Commercial Area, Pedestrian Street, CyberCafe, Bank, Exchange House .